Replicating a successful night of food drink and conversation in the Italian style is not necessarily about slavishly following the instructions in the recipe book and ensuring the wine and mineral water come from an impeccable source. Because to the Italians, it is the people around the table as much as the food that will ensure the evening can be deemed a resounding success. Relax, keep things simple and do not treat the kitchen as solely your domain. This is the part of the house that is at the heart of the evening, from where the food will emerge that will fuel the lively debate, laughter, perhaps occasionally tears, that are all part of the shared experience among family and friends. This, in essence, is what entertaining Italian style is all about. In Italy, one of the traditions of arriving at a friend’s house for dinner is to ensure you have something to contribute to the evening. That doesn’t mean an expensive bottle of wine, though some indulgent chocolates to sample with the post-prandial espresso wouldn’t go amiss. 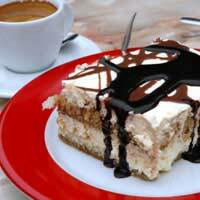 No, rather a tiramisu or a torta, home-made naturally, the dish is the result of devoting time in your own kitchen to making a valuable contribution to the evening. Perish the thought that there is any element of competition here; any attempt at undermining the skills of the host by outshining their efforts with a culinary coup de grace. But assuming that rivalry, friendly or otherwise, is definitely not on the menu, the simple act of contributing, in essence of sharing the workload, is all part of bringing something to the party. Similarly, back in the kitchen, don’t be shy in inviting everyone to get involved both in preparation and taking the finished dishes to the table. Not only does it relieve some of the burden but further emphasises the spirit of sharing. Just ensure that an overbearing friend or relative isn’t dropping in a little extra seasoning behind your back or suggesting a particular herb always works better for them than the one you are planning to use. Food is such a passion in Italy that it is very rare to find anyone who doesn’t have their own opinion on how a dish should be constructed. While encouraging the spirit of sharing and teamwork, don’t forget that this is still your kitchen. Finally don’t forget to take things slowly. The structure of a traditional Italian meal involves a number of courses, but even so there may be the temptation to rush through them in order to bring the evening’s labours in the kitchen to a conclusion. Again, work on the principle of sharing the burden, so that the courses appear at a pace that allows the conversation to develop and deepen as the evening wears on and the odd alcoholic drink loosens the assembled tongues, ideally in unanimous appreciation of their host.